Wavy Bay tree. 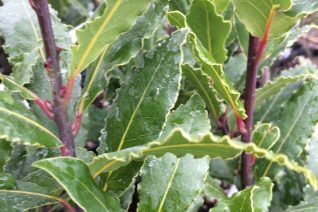 Good, cold hardy form of this shrub/tree that is prized for culinary use. Fast growing pyramidal shaped dense shrub to 15′ tall and 8′ wide in 10 years. Full sun and rich, to average well drained soil. Little summer water when established- but tolerates regular water in gardens. Very easy and long lived in containers where you can observe the undulate, wavy edges of the leaves. Protect containerized plants from temperatures below 12ºF. Avoid subfreezing wind. Otherwise a hardy easy to grow evergreen. Give this shrub room- it has greedy roots and is not a good neighbor. Aromatic foliage is also useful for holiday garlands and wreaths. Small yellow flowers are not conspicuous in spring. Moderate deer resistance. Mediterranean.